Graduation is always worth celebrating, and celebrating proudly. It marks a year of accomplishment and success, not to mention being a great way to gather friends and family. Here at Polka Dot Design we have you covered with our comprehensive collection of graduation invitations. 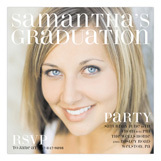 Once you browse our variety of graduation party invitations, we guarantee you'll walk away satisfied. We carry such an array of choices in terms of stationery, personalization options, and design that you will surely find something you absolutely adore. Once you select an invitation for your celebration, we take it one step further and even help you find the perfect words for a perfect occasion. Our graduation invitation wording ideas cover all bases, making the process of invitation selection a cinch from start to finish. Perhaps you're looking for a way to notify family and loved ones of an upcoming graduation. We provide an assortment of graduation announcements, perfect for letting everyone know of the memorable day. Maybe you're not planning a party, but still want to extend the graduation information, then look no further. An exciting and unique way to invite your family and friends to the big celebration is with customized graduation photo cards. Add a bit of your own personality and character with each photo card you send. Whether the photo is specifically for college graduation invitations, or simply a kindergarten commencement, Polka Dot Design will help you every step of the way. It's time to move the tassel to the other side and walk across the stage of the impending graduation ceremony, raising a glass and passing along a great big high five to you graduate! Stepping into the next chapter of one's life is a huge accomplishment and one that we think most certainly deserves an extravagant celebration! When else in your life do you get to wear a robe and a tassel and still be considered a tremendous success? If that's not a reason to celebrate we don't know what is! Here at Polka Dot Design, we will guide you all the way. You've worked hard enough so let us take over and help you create a celebration worthy of a diploma. Whether your school graduate is graduating from kindergarten or the finest university we are here to celebrate with you. We truly believe that education and knowledge unlocks the future for the great minds of this world. And we see no reason to not send out an invitation in honor of all that has been accomplished. Maybe you want to send invites cards to all of your community over to celebrate with a fajita fiesta party or perhaps you can host a "best is yet to come" roast where everyone comes with a little joke, a little jab and most of all a whole lotta love to help your graduate realize that the future is a serious subject but they never have to take themselves too seriously. Life is truly all about having fun and making the most of what you've been given. So why not send out a graduation invitation to let everyone know that it's time to celebrate. Oh, the places you will go is a really fun theme to honor your graduate no matter their age. You can decorate with wonderful literature books that can be regifted to the graduate to fill their collection for years to come. Imagine being a part of building someone's library. At Polka Dot design we truly believe in the art of knowledge and the gift of the written word. Add fun little touches to the event by encouraging everyone to inscribe the book with a personal note, word of advice, or perhaps a favorite quote. A really clever idea is to add a $10 bill to the end of the book as a little extra incentive to make them read it all the way through. It's a lighthearted way to get them involved in the book of your choice. No matter the age it's always important to take the opportunity to celebrate your graduate with a graduation party and the perfect personalized invitation, perhaps you could consider sending graduation photo cards with your favorite photos, everyone loves seeing how much the kiddos have grown up. Though the best is yet to come it's always smart to celebrate the present moment and surround the graduate with love and support as they enter the next chapter of their lives. As the end of the long school year approaches and all of the events start to pile up, things can get super busy. But the one thing you don't want to forget to do is to send out your announcement, honoring your graduate. When one of our children becomes a graduate, whether they are a high school graduate or a kindergarten graduate, there's no better time to help them shine, so go ahead and order your own grad party invites with Polka Dot Design, your online resource for cute invitations sure to make your graduate feel special and honored. Perhaps your graduate is incredibly creative and you need some ideas for parties that are out of the ordinary. Let us be there to help you, our stellar staff of designers can assist you to create the perfect card. Afterall, you don't need to be an expert when you have us to be that for you. Whether your child is graduating from the Fashion Institute of Design and Merchandise with their product design degree or maybe they take another route by heading to a local community college and earning their cosmetology certificate, no matter the path, graduation school events are monumental and certainly worth attending, but nothing compares to a graduation party just for them, or maybe you could pair three of the graduates closest friends for a big graduation bash, that way you can share the responsibility and have even more fun! It's your opportunity to highlight the extraordinary achievements of your graduate. Whether it's a high graduate honor student that has had their heads in the books for the last four years or your little one is making his mark by leaving Kindergarten for good! Set aside one evening on your calendar to gather with friends and family to surround your graduate with honor, love, laughter and probably some gifts, which is always fun! Perhaps you've decided to help host a party after the graduation commencement ceremonies, the invites have to be sent out so that everyone can save the date and plan on attending your party! Sometimes schools offer you graduation invites but we here at Polka Dot Design have found that most students and grads want something different. That's where we step in, let us help you explore all of the options that are available to you. Whether you want to host a fiesta for your grad or a black-and-white buttoned up affair, we have all kinds of options for you. We even had a beautiful bouquet of pink on an invitation with the word "bravo" to cheer on your graduate in style, grace, and celebratory jubilation! We truly do believe in celebrating every moment of life, and we are here to celebrate life with you. We have humor filled invitations if you want to celebrate with a light heart, we also have more formal invitations for the commencement portion of your graduate's life. No matter the aesthetic that is chosen we can help you make your graduate sparkle like no other. If you have a graduate in your life that deserves some celebrating, you know all about the hunt for the perfect senior announcements high school kids go through. The most personalized option is a photo graduation card. This invitation idea allows your graduate to be in the spotlight. The graduation open houses are a long time favorite. A fun idea is to use a play on words. Using the term "set sail" is guaranteed to earn you some high marks in the creativity department. A Nautical Graduation Party is classic and fun. The simple use of balloons can be the focus of this design. A palette of bright yellow and white give a nod to sunny skies ahead. The blue indicates best wishes for a bright future. Try adding a foil crescent moon balloon turned sideways. This creates a foundation for a sailboat creation. So cute! This project would be great as a graduation party decoration or dessert table backdrop, or just as a fun surprise at home for your favorite grad. You can also switch up the designs of the theme to work for other nautical party themes such as a "bon voyage" celebration too! Have a groovy grad party to kick things up a notch. There is no reason for a party to be a nod, make it a blast instead. Flashback to the 60's and invite all of the guests to dress up. Use pops of turquoise and lime green. Add in hot pink to really make the night come to life. This party can add in wishes for the kiddo to always stay wild at heart. The flower power Party can be inspired by the guest of honors happy spirit. Have it around the pool if you have one. Use tie-dyed table lines and a disco ball as the centerpiece. Nothing says PARTY like confetti! So mix up paper and metallic confetti and glue it to wire halo crowns, paper hats, champagne glasses. You can add the mixture to paper cups, blowers, you get the idea. You can glue this mix to anything that you would normally add glitter too. But use confetti instead. Add lots of fun confetti to the food tables. Create a kid-friendly Mimosa bar with its fruity fun colors. Have a menu of festive cocktails for all ages! Some more graduation party decoration ideas include using a key invitation by Stevie Streck. The theme can be "keys to your success". After all, graduation is a time to reflect back on all the past successes. Taking the time to laugh about special memories, and speak love and good wishes as you look forward to a bright future. It's so important to let your graduate know that there are so many special moments ahead. The "Keys To Success" themed graduation party is really fun to create. The use classic colors of navy blue and white or gold. Decorate a natural, outdoor landscape with a bounty of food and flowers. A fun and joyful wishing bar can be created on the patio. It's the place for family and friends to leave notes of congratulations and advice along with any graduation gifts. It is the ideal way to honor him or her and how far they have come and how much they have grown!